"FIND YOUR WINGS at THERMAL VALLEY"
Let Thermal Valley Hang Gliding be your sky guide. Thermal Valley Hang Gliding offers tandem discovery hang gliding flights. Fly with an USHPA Certified aero-tow tandem instructor while being immersed in the atmosphere. 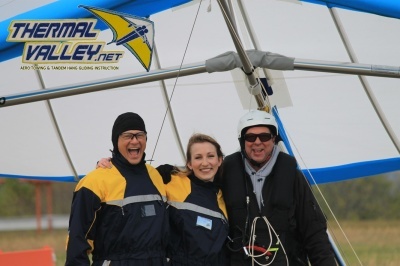 Learn how to and actually fly the tandem hang glider! Your instructor will take off and land and you learn to fly the glider after releasing from the tow plane (Houston the Dragonfly). You will be amazed at how easy our tandem glider handles. Learn how to judge speed, turn, and feel the glider. After a little practice, you will be able to crank and bank. 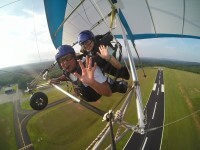 Hang gliding is truly an experience like no other. Let Our Family Fly Yours! Aviation in its purist form. Learn basic flying skills with an USHPA certified tandem hang gliding instructor. Soaring like an eagle high above the earth. Your senses coming alive as you are immersed in the atmosphere. At the South Mountains and the meandering Catawba River. Get a bird's eye view of Grandfather, Table Rock, and Hawk's Bill mountains. Your experience with your friends and loved ones with an optional HD video of your flight. Let our family faciliate your aerial adventure that will be remembered for a lifetime. Imagine gliding through the sky just like a hawk or an eagle. Learn how to actually control the hang glider with your USHPA certified tandem aero-tow instructor. Hang gliding is the closest humankind has come to bird like free flight. Capture your flying experience with an HD video to share with loved ones and friends. Marvel at Grandfather, Table Rock and Hawk's Bill mountains. 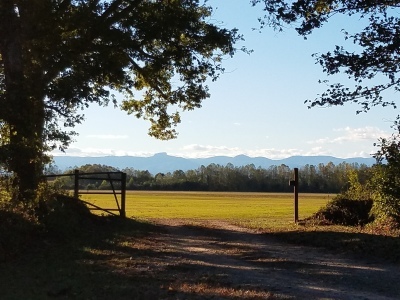 Experience free flight while seeing the shimmering Catawba river meandering through the Catawba Valley. Schedule Your Discovery Tandem Flight On Line Today!